Lover's point #6 was perfect for a beautiful and relaxing place to stay in the perfect location! The townhouse is very comfortable and spacious with breath taking views. The windows in the unit and the balcony were amazing for enjoying almost endless ocean views. The entire place was perfectly furnished from kitchen to bedrooms to bathroom! You could easily stay in the townhouse the entire trip and not regret a thing...but it is also perfect location for enjoying the outdoors without driving. From ocean front running and walking to great bakeries and restaurants it was a win-win. I can't wait to come back! Spectacular ocean and sunrise views of Lover’s Point Beach and the entire Monterey Bay await you in this coveted corner unit. From the open floor plan to the picture postcard views, this comfortable accommodation reduces even the most stressed of guests. Swim, dive or kayak at Lover's Point cove across the street: with a white sandy beach for sunning, a beach volleyball court, snack bar, and grassy areas for picnics, this park is a favorite of visitors and locals alike. And once you're completely relaxed, Pacific Grove is convenient to an amazing range of activities on the Peninsula. Within minutes you can be touring scenic 17-Mile Drive, hiking to secluded Big Sur beaches and Point Lobos, horseback riding, deep-sea fishing or whale watching. Play golf at the oceanside Pacific Grove Golf Course, affectionately known as a "budget-minded alternative" to Pebble Beach, or stroll down the coastal recreation trail just outside your front door and commune with seals and sea otters. The shops and restaurants of downtown Pacific Grove are just three blocks away. For an even more varied dining experience, a longer walk or short drive will take you to Cannery Row, Fisherman’s Wharf, downtown Monterey or Carmel by the Sea. The well-equipped kitchen features maple cabinetry, granite countertops, and stainless GE Profile appliances. Cable television and BluRay DVD players are provided (the 60" TV in the living room has DVR), as is high speed internet access. Bedrooms are furnished with king and queen beds flanked by reading lamps, as well as flat screen TVs. The lower bath has a granite vanity with dual sinks and a shower over tub. The unit is heated by central forced air and includes a GE SpaceMaker front-loading washer and gas dryer. Carport parking behind a security gate is conveniently located near the entrances to the complex. This "townhouse style" dwelling accommodates up to four guests and features exterior stairs to the second level entrance. The living room, dining area, kitchen and a half bath are on the entry level; two bedrooms and the full bath are downstairs at ground level. There is a small deck off of the living room that frames picture postcard views of Lover’s Point and the Monterey Bay. Living, dining, kitchen and powder room are on upper level. Stairs from bedrooms to upper living area. If you are looking for a place with great views, the comforts of home, and total relaxation, this is the place for you.You can look off in several directions and see great views of the bay. You can take a walk or ride a bike on the trail across the street. You are close to several restaurants. If you like to swim or surf, you have a place across the street to do that.The place has all the comforts of home and is super clean. If you like to cook, you have everything you need. The beds are comfortable. They have plenty of towels and they even have beach towels, if needed.Having an assigned parking space is a definite plus. Besides it was very quiet.The balcony has a couple of chairs enjoy the views of the bay.We look forward to coming back soon. What a spectacular view! Everything about our stay was perfect—clean and well-stocked accommodations, great location, and spectacular weather. I’m sure Ocean View Drive is a nightmare during high tourist season, but downtown Pacific Grove, the Monterey Bay Aquarium, and Cannery Row are only short walks away. Very clean, well supplied, beautifully decorated, super comfortable and great location! We loved the location and the view from this rental. We had a perfect view of Lovers Point and the ocean right from our balcony. We were within walking distance to multiple restaurants around Pacific Grove. Our rental had 2 bedrooms and 2 baths with a nice large living area that would be perfect for 2 couples. The staff was very friendly and efficient. We had easy access to them before and during our stay. I highly recommend them. The views are wonderful and accommodations very nice. Located very close to Cannery Row and downtown Pacific Grove shopping. However, the condo is right in front of a stop sign off of Ocean Avenue so the traffic was surprisingly noisy day and night. Also, no elevator to the upper floors so this condo is not a great fit for someone who has difficulty climbing stairs. We had a relaxing 4 day stay at Lover's Point 6. The apartment is clean and nicely appointed. The location is perfect and beds were very comfortable. The stairs in the complex/apartment is a drawback for anyone with ambulatory issues though. Pacific Grove is a relaxing area with great restaurants and shops all within walking distance to Lover's Point. Being near the Monterey Aquarium is a huge plus as well. Also close proximity to Carmel, 17 mile drive, Big Sur and Point Lobos made it all the more enjoyable. Nice spot would do it again. I cannot say enough good things about this rental. The view was incredible. The house was clean and looked just like the photos shown on the website. After our long days sightseeing, it was a pleasure to come back and relax at the rental. The rental included all the amenities and everything we needed was on-hand (towels, linens, etc.). The onsite parking and access to the surrounding sites was an unexpected bonus. I highly recommend this property and will definitely use Monterey Bay Property Management next time I travel to the area. The house is ideally located overlooking the Sea and Lovers Point. It is extremely well equipped and spotless clean. The service provided by Monterey Rentals is first class and I have no hesitation recommending this property. We had a lovely stay in Lover’s Point 6. The appartment was perfekt for two couples and had all we needed to have a nice stay in Monterey. The lokation is perfect with a wonderful view. We were thoroughly impressed with both the location across from Lover’s Point and the well appointed unit. And one of my favorite things was never having to worry about parking. Thank you so much, we definitely plan to return. This home was perfect for our needs. The gorgeous water view over the bay was our main reason for choosing the home, and it did not disappoint. The area is wonderful - there are a lot of beautiful walkways and nice coffee shops close by. We also walked to the aquarium which is less than a mile away, together with lots of other shops. The kitchen was well equipped, the rooms were comfortable and the washer + dryer, as well as free parking on the premise was a bonus. Kyle’s communication on behalf of Monterey rentals was also thorough and timely. Will definitely look them up if ever travel to Monterey again! We agree: those views are breathtaking (and the owner promises to bring two more beach chairs when he comes down next month!). Our family came up to Monterey for a long weekend and had a great time at our Pacific Grove rental. The view was outstanding, and the amenities were lovely. The kitchen was well stocked with utensils, cookware, & a toaster so that our family could enjoy breakfast before leaving for our day. Everything was a short walk from the rental. We never needed to use our car. Would definitely recommend the place! Lover's point #6 was perfect for a beautiful and relaxing place to stay in the perfect location! The townhouse is very comfortable and spacious with breath taking views. The windows in the unit and the balcony were amazing for enjoying almost endless ocean views. The entire place was perfectly furnished from kitchen to bedrooms to bathroom! You could easily stay in the townhouse the entire trip and not regret a thing...but it is also perfect location for enjoying the outdoors without driving. From ocean front running and walking to great bakeries and restaurants it was a win-win. Very nice accomadations that were presented very professionally. I would stay there again if the time arose. Lover's Point #6 is a two bedroom 1.5 bathroom condo with a view of Monterey Bay/Lovers Point from every window. The bedrooms are comfortable and cozy. The living room/kitchen is well laid out with all the furniture positioned to take advantage of the view. For a romantic get away in Pacific Grove, it would be hard to beat this place. It also has a gated parking area that is a real advantage this close to the water. In the mornings you can enjoy breakfast/coffee while watching waves and surfers. In the evenings, the lights of Monterey across the bay add to the overall ambiance of this delightful condominium. It has become our go to location for future visits. Very nice place with great views and fully equipped. It does have a washer and dryer, the only draw back is the lack of parking for more than one vehicle. I stayed here for 3 nights with my daughters. It was perfect! I can't even imagine a better location, directly across from Lover's Point. This unit has windows on two sides so you get never ending views of the water. We did the walk along the beach into Monterey, walked to the monarch sanctuary, shopped along Lighthouse, and walked to dinner and breakfast at terrific PG restaurants. The unit was beautiful, clean, and had everything we needed. Having reserved parking was a definite plus. I will definitely stay here again! The condo at Lover's Point 6 was in a fantastic location for our family of four. It is within walking distance of everything we needed. Our family stayed at the condo for a week and didn't even get into our cars for the first 4 days! The view is unbeatable. And the condo is outfitted with everything you need. The mgt company was very responsive and proactive to our needs. Thanks for an amazing and relaxing vacation! We booked three nights here as part of a road trip from San Francisco to LA and back and once we arrived we wished we could stay longer. The apartment is excellent, very clean and tidy, well equipped, comfortable, and the location is absolutely wonderful, right on the bay overlooking the ocean with lovely views. In addition Lovers Point is a bustling scene with people running, swimming, kayaking, cycling and walking their dogs and it was enjoyable to sit on the balcony and watch this world go by. During our time there we also saw two weddings on the headland! Lovers Point is a wonderful location for a peaceful break; we had been told that Pacific Grove was a good place to stay to enjoy Monterey and Carmel and I am very glad we took this advice! Monterey is a short walk along the coast path and Carmel a short drive via 17 Mile Drive. The Main Street has numerous restaurants and cafes and there is a large supermarket just 5 minutes drive away. Altogether a really lovely apartment in a wonderful location. Four of us spent a wonderful five days at Lover's Point 6. The proximity of the condo to the waterfront, Cannery Row, grocery store and shopping can't be beat! The condo unit was very quiet and peaceful and was well stocked with kitchen equipment as well as cleaniing items, paper goods and spices, olive oil, etc. We all enjoyed our days out exploring the beautiful Monterey/Pacific Grove/Carmel area and then looked forward to returning to our condo to wine, comaraderie and incredible views of the Pacific. We never tired of walking along the coastline and viewing the sea lions and sea otters. We did have difficulty with the coffee maker, and ended up purchasing one that we left in the condo. There were a few other minor gliches that were reported to the owner who said she was going to be there the weekend after our stay, and would take care of them. All four of us agreed that we would stay here again in a heartbeat! Excellent area but disappointed in unit and rental company. Pacific Grove is excellent. Lovers Point is amazing, but the unit we stayed in was a large let down. The biggest issue was ANTS. When we arrived on Thanksgiving Day the kitchen had dead ants in the sink and live ants crawling on the kitchen counters and walls and even coming out of the electrical outlets. Realizing that most likely nothing could be done on Thanksgiving afternoon, we waited until the next morning to call the rental company and let them know about the severity of the problem. They promised to have someone come and treat the rental that day while we were out. We made sure there was NEVER any food left out or water source available for the ants. It appeared no one came because the ant problem continued. There were even ants in the carpet. On another note, it appears that several of the walls of the unit have either been patched or spot painted rather than painting the entire wall. This gave a speckled appearance as you would look down the hallway and stairwell. Not major, but when you are paying top dollar, you expect a top dollar rental. Finally, since we were traveling on Thanksgiving Day, we wanted to be able to get into the unit prior to 3 PM. We paid an additional $200 to get an early check in of 1 PM. When we picked up the keys to the unit, they were left in a large mail box at the rental company and the rental company had been closed since the end of business on Tuesday. This meant our unit was actually ready to be occupied the entire day prior to our arrival rather than having them working extra to accommodate our request. It just seemed greedy on the company's part to charge this extra amount when it didn't require any additional work or effort on their part. I booked this on line and had very little contact with the rental company. I had even sent them a couple emails requesting additional information about the unit and the possibility of an early check in but never received a response. Finally, I called and spoke to them in person. Not great customer service. We're glad that despite these issues you enjoyed your visit. Please come back again - we'd like the opportunity to turn a "2" into a "5." Amazing getaway and great service! Best place ever! My husband and I have stayed in hotels along Cannery Row in Monterey, in the Carmel Highlands hotels, but Lovers Point #6 is our new "go-to" place. There is so much to enjoy: the location, beautiful views from the condo, the openness and space (2 potties are important! 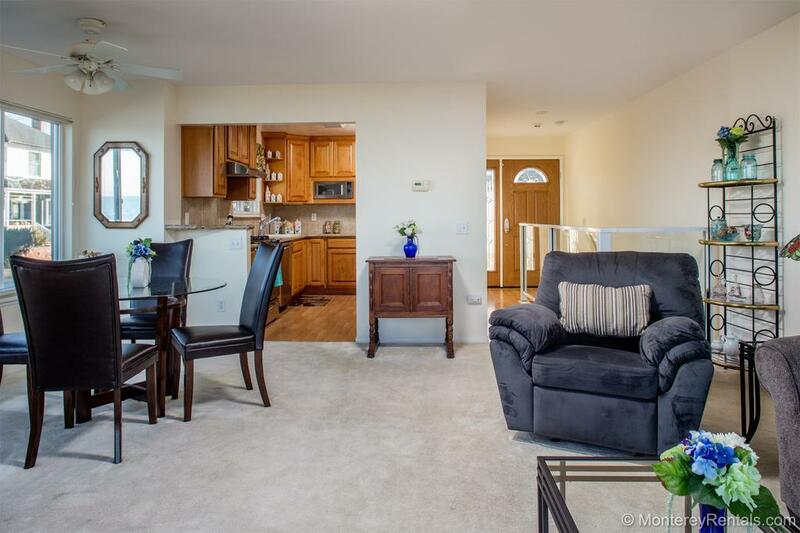 ), terrific kitchen, 3 TVs with DVR, wifi, reserved parking. So much better than a hotel suite and the best of the condos! We walked everywhere -- to tidepooling, to Cannery Row along the fabulous ocean walk and barking sea lions, to the Farmers Market on Monday late afternoon, across the street to a fabulous dinner at Beachhouse. This condo has it all and is beautifully decorated to boot. Note: if you stay, be sure to treat it very well -- it feels like a home and we want to enjoy it that way when we return! One other thing to note, checking in and out was a breeze! If we had any questions the agent, Kyle Burritt, was available to help and quick to respond. I would recommend Monterey Rentals to anyone who is looking for a top notch professional vacation rental company.